here are some great blogs that you should check out! love of collage - lorraine is an artist and crafter extraordinaire, there is nothing she won't try! mixed media, jewelry-making, knitting, felting, sewing, painting, quilting, altering...her style is truly original and her work inspires me every day. fabric, paper and stamps—oh my! - glenna has been a friend of mine for over 20 years. she started her blog just this year and she is having a blast with it. she is a terrific quilter and cardmaker - and sometimes she combines her two talents! 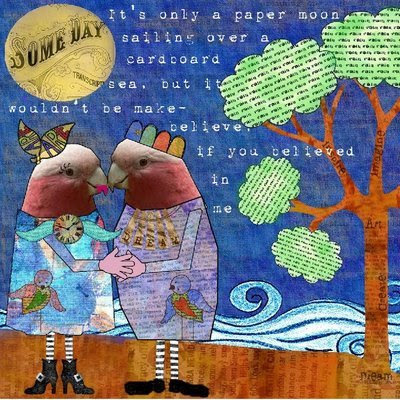 ozstuff - marie is a wonderful collage artist in australia who works magic with vintage images and whimsical characters. i hope you've enjoyed this little blog hop! 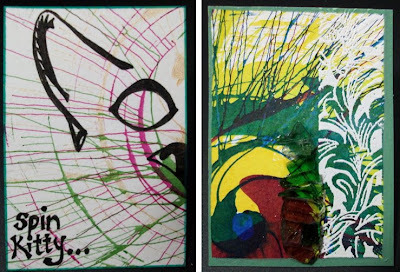 these are my last 2 spin-art atc's, i promise! i still have tons more spin-art cards in my stash, but i'll move on to something else...even tho' they are so much fun! i drew "spin kitty" for an atc challenge in one of my flickr groups where the theme is cats. i liked how the spun paint looks like whiskers, and the cat's eye is positioned so the pink streak looks like the pupil. on the edges of the green one, i played with a new paint marker by elmer's that i really like. since becoming a stampin' up demonstrator, i have finally come to appreciate stamping with embossing powder...hence the white border stamp. and i love my new bag of glass mosaic chippies too! thanks so much to all of you for visiting my blog and entering to win a copy of claudine's wonderful book...and an extra special thanks to claudine for helping to spread the word...ya just gotta love twitter! the winner was selected using random.org....and it is charity from florida! charity has five kids and loves to scrapbook, and she's a fiskateer too! congrats, charity—you're gonna love this book! 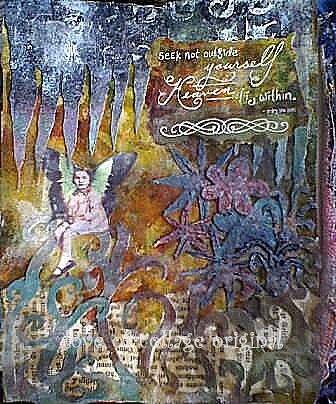 and i'm still on a spin-art atc binge! i just love how the variations in the color and "splash factor" create unique personalities for each card. i enjoy swapping atcs with other artists, so if you'd like to make a trade, let me know! i'm the guest designer this week at this art challenge blog, one powerful hour. 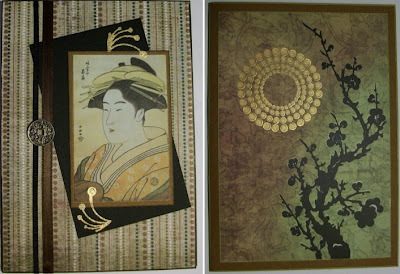 i chose an asian theme, featuring these two greeting cards i made for my mother. so go on over there and see what you can make in an hour! i am giving away a brand new copy of claudine hellmuth's book, "the scrapbooker's creativity kit" along with some 12x12 scrapbook papers, 4 sets each of 4 coordinating sheets. just leave a comment here to enter...and get your name in twice if you also sign up for my blog updates via email! i will draw a winner at random on wednesday night 5/27/09. have a look around while you're here...thanks for visiting! this ATC was fun and different for me. i painted a little chipboard tree bronze and then coated it with crackle medium, which made it look like it had bark. then i painted a piece of lutradur green and blue, burned the edges, and added some little orange gems. i like the little clock face for the sun. i played with pouring medium yesterday...blended it with blue paint to see how long it takes for a puddle of it to dry. the answer is several hours....my little puddle wasn't dry when it was time to move my craft mat, so I started blowing on it. blew some of the puddle into a crazy spotchy shape, then i blew trickles of it along natural "drip lines" on the mat. when it was dry, i peeled it off and got these fun glossy plastic-y pieces to collage with. here's another spin-art atc from my new stash. i added a little plastic owl, and the blue drips of pouring medium, some piercing, and a few metallic dots. cute! had a blast today with a new friend lisa that i met on facebook. we shopped, lunched and crafted...and discovered just how much we have in common! lisa worked on a super cute shaker card and i worked on a grungeboard atc. i blended 3 different acrylic paints for the background, then embellished the stamped images with glitter, embossing powder, glass beads, broken sea glass, burned lutradur, hot wax, and glaze medium. here's a tutorial on how to make this atc - you'll want to pause the blog music first by scrolling down to the bottom of all my posts to the radio gadget. here are some atc's i made with cast-off spin-art cards from a trade show i recently attended...way fun to crop and embellish! on the left, i added a piece of painted and burned lutradur, plus some piercing, foil transfers and metal washers. in the middle, i added a flocked scroll transfer, piercing and 18k gold leaf accents. on the right, i added glass bead texture gel, crackle medium, and stitching. for today's follow friday, i am featuring the winners of my blog follower drawing. i realized that i never did do my drawing on may 5th (oops), so i drew two names at random for may 2oth. these talented women both happen to be new facebook friends of mine too...be sure to visit their blogs and see their wonderful work! kimberly and carmen are each getting one of my asian-inspired greeting cards. enjoy...and thanks for following my blog! wow, daniela's altered book class today was so inspiring. i've been wanting to alter a book like this, what a great day! i never seem to follow the rules in daniela's classes. thankfully she is really great about working with both kinds of students - those that want to make her beautiful piece exactly as she designed it, and those who want to take all the goodies she provides and run off in a different direction! we took an old book and glued a chunk of pages together in the middle with gloss medium. then we carved a niche out of the center with a blade. i have this wonderful broch that a family friend, steve kalar, made years ago—and i've been looking for a way to showcase it. i used a lot of walnut antique colorwash and distress ink to age everything, I wanted the front of the niche to look like beat-up leather, and the little schoolboy is guarding his treasure. i contrasted the collage on the opposite page to be more feminine with a flowery dress form and graceful curves in the torn papers. i am so happy with this piece - the pictures don't show how warm and caramelly coffee colored it is, plus there are accents of gloss, glitter, gold leaf, and crackle medium all around that make things stand out a bit more. over at the scrappy hours challenge blog, the theme is dogs or cats. i couldn't resist using this pic of little lamb-like poodle pups that were confiscated from a huge puppy mill by the aspca in february. these pups spent time with my friend bernie berlin before being adopted. bernie is an artist, an author, and the founder of a place to bark animal rescue in tennessee. i chose scruffy paper and embellishments to go with these pups...the yellow frame is lutradur that i painted and burned with a candle flame to make the edges lacier. for those of you on twitter, you know what "follow friday" means...every friday, tweeters all over the twitterverse post their recommendations of other tweeters that they think are worth following. btw, if you want to follow me on twitter, click here. tah-weet! today one of my fellow tweeters, terri stegmiller, an artist in north dakota, was kind enough to put me on her twitter follow friday list. it gave me an idea...each friday i want to feature other artists and crafters whose work i find inspiring. i think it's worth your time to click on over and see what they do! so let's start with terri - her work is really fun, i love her faces. she is a teacher, an author, and she runs online art classes at two creative studios with sue bleiweiss. they have a free projects page too! another artist who's work, humor and copious amounts of energy that i just adore is lauren ferguson. her blog, everything altered, sports her tagline "there are no mistakes in art, just opportunities to embellish" which has become one of my mantras too! this is a skirt, about 2' long, made from sheets of colored plastic film that lauren scored and pleated by hand for the film's manufacturer to display at the namta trade show. i was at the show and got to see this beauty up close and snapped this picture, which doesn't do it justice. it's really much shinier and more colorful in person! during the namta show, i visited the colart booth, where they were doing spin-art with their liquitex inks, paints and mediums. such a great idea! i was rather conservative with my splashes, it always looks like there is so much more paint on the card while it's whirring around. can you believe at the end of the show, they were just going to throw away all these beautiful demo cards of spin art? of course i jumped in and rescued them...can't wait to do my first spin-art collage! i'm experimenting with layering paints and inks - the canvas book is a great foundation for it, i really like the extra texture it provides. this is the cover i made while demonstrating in our booth. not sure why i've been gravitating toward geometric designs lately, but i like it! 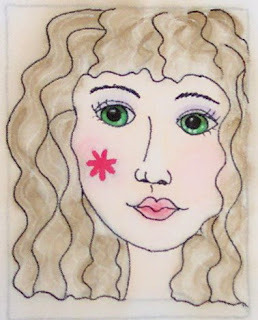 this was for a big fiskateer atc swap with 26 partners, so i had to keep it simple to get them all done in time. the theme was candy - so i used my gumball fabric paper, adhered it to cardstock, and inked the edge with a red marker. i stamped a "lucky" quote, and embellished one gumball with glitter and added a lucky penny....remember the good ol' days when a gumball was just a penny? neato bandito! taking a cue from my friend lorraine, i have made an atc wallet out of timtex and lutradur. i love my fabric atc wallet that lorraine made, i use it to carry my cards to my monthly atc club meetings. for the outside of the covers, i painted two 4"x4" squares of timtex with india inks and acrylic inks. the colors soak in to the timtex and blend and bleed in their own way. i just love this effect! i heat-stamped circles on the timtex, melting it just slightly. i burned one hole straight through on each cover for the closure and trimmed the edges with a scallop to better hold the closure in place. then i glued the outer panels an accordion-folded length of lutradur inside each cover - fabri-tac adhesive works great. i glued shorter strips on both sides of the accordion to create pockets. inside the covers, i painted some more, then adhered a strip of lutradur that i burned holes into to create a lacy effect. i spritzed the strip with a bronzy color wash spray. i chose to keep the interior of the wallet plain white to really show off the lutradur's texture and strength, it's wonderfully versatile stuff. i embellished my wallet with pocket clips, eylets, washers and brads, then added a magnetic closure with some chenille yarn. the eyelets add some stability too. this is one of the projects i will be demo-ing at namta next week (nat'l art materials trade show) - i can't wait! i love working with acrylic paint, especially the metallics. i experimented with blending in acrylic inks to change the color and thin it out too. this atc started on a 6x6 piece of white linen cardstock, then i cropped the area that i liked the best down to 2.5x3.5. i saved all the painted trimmings to use in collage work later. this abstract image reminds me of stalks of a heather bush on a hill in the sunshine. i am swapping atc's with my friend ann this week. the challenge at scrappy hours this week is flowers - join us! i just love these collage flowers and leaves and the leaf charm straight pin...i buy these lovely embellishments from my friend daniela, she makes the best kits!